World Autism Awareness Day is an internationally recognised day taking place on 2 April every year. In the week surrounding this day, we encourage the public to take part in World Autism Awareness Week – a full seven days where people across the UK take part in activities to raise money and awareness for the National Autistic Society.This year, World Autism Awareness Week will be taking place from 1 – 7 April. Fundraise your way. Sign up to receive our fantastic fundraising pack full of great ideas and resources – including Anne Hegerty’s fiendishly difficult quiz, or trying Jane Asher’s spectrum cupcake recipe. Fundraise at school. Sign up and receive a specially tailored fundraising guide for teachers and school staff, which includes free awareness resources and lesson plans. What’s more, every school entry we receive will be automatically entered into our exciting prize draw to win a school visit from Anne Hegerty. Join us on a Spectrum Night Walk. Join hundreds of other passionate walkers on Saturday 6 April across London, Manchester, Glasgow, Cardiff or Belfast, and raise money and awareness for autistic people and families. Take on our virtual challenge. Go the distance for the 700,000 autistic people in the UK with our unique virtual challenge, 7k for 700k. Raise awareness at work. Hang up our handy poster in your office or place of work. 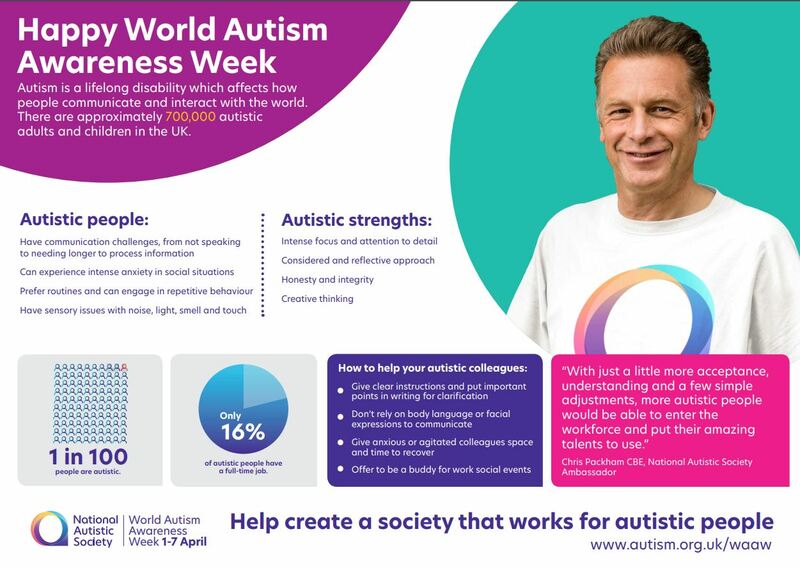 With the help of Chris Packham, we’ve compiled a few simple facts about autism, as well useful tips on how to support autistic colleagues. This entry was posted in Apr, Events, Health and tagged Autism Awareness Day, Autism Awareness Week. Lower Valley Friday Flyer 29 March 2019 – OUT NOW! !